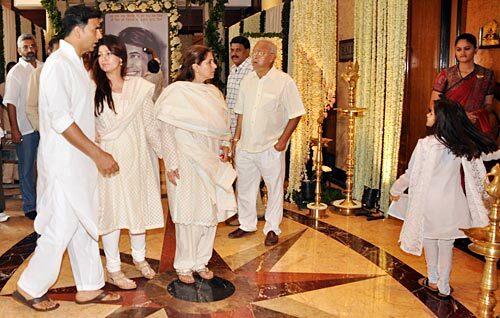 The film industry turned up in large numbers at the chautha of late superstar Rajesh Khanna, who passed away on July 18. It was held at Taj Lands' End, in the western surburb of Bandra, Mumbai, on Saturday evening. Rajesh Khanna's daughter Twinkle, who is pregnant, could not attend the funeral on July 19. 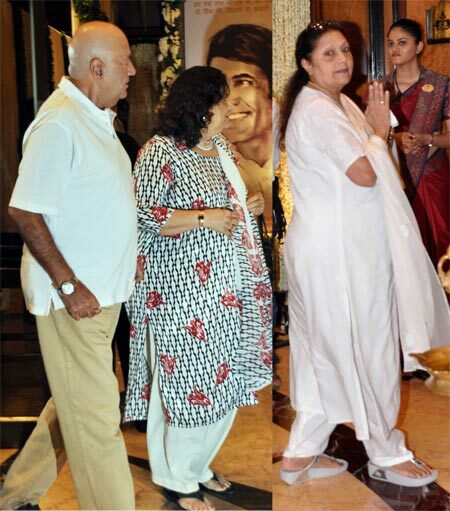 At the chautha, she was accompanied by husband Akshay Kumar and mother Dimple Kapadia. Twinkle's son Aarav had performed the last rites at his grandfather's funeral. 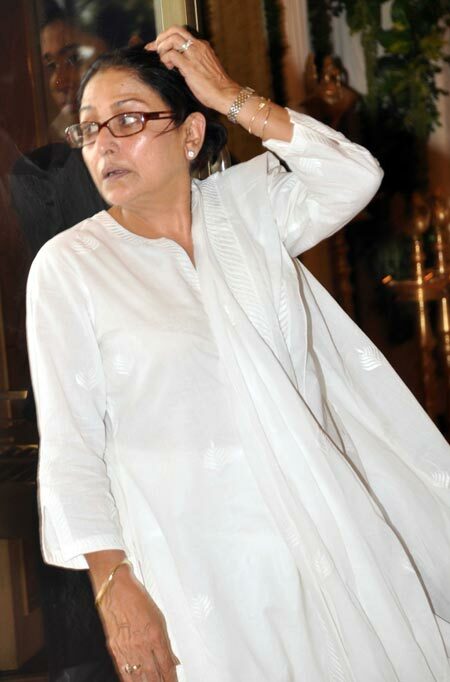 Rajesh Khanna's former long-time girlfriend Anju Mahendru paid her last respects at the chautha. 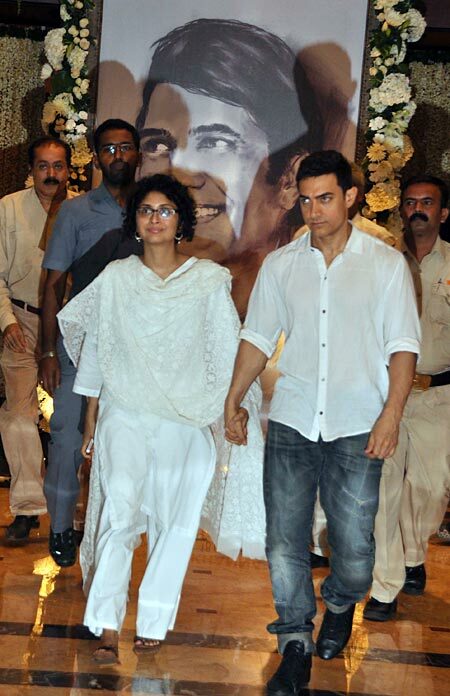 Aamir Khan, who had not visited Rajesh Khanna's house on the day he passed away, arrived at the chautha with wife Kiran Rao. Click here to see the stars who had visited Khanna's house on the fateful day. 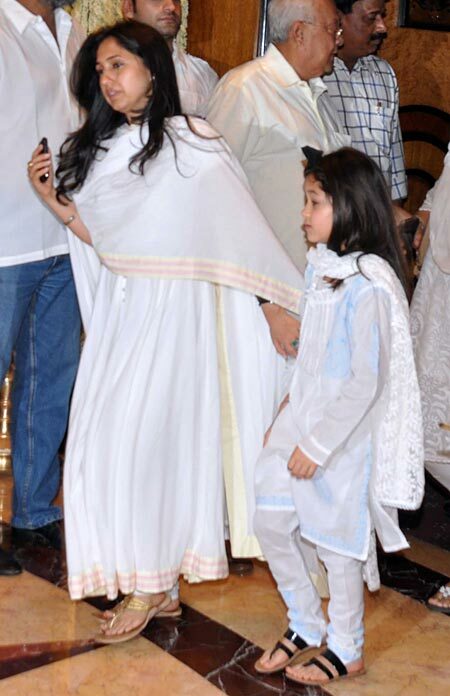 Rajesh Khanna's younger daughter Rinke was accompanied by her daughter. 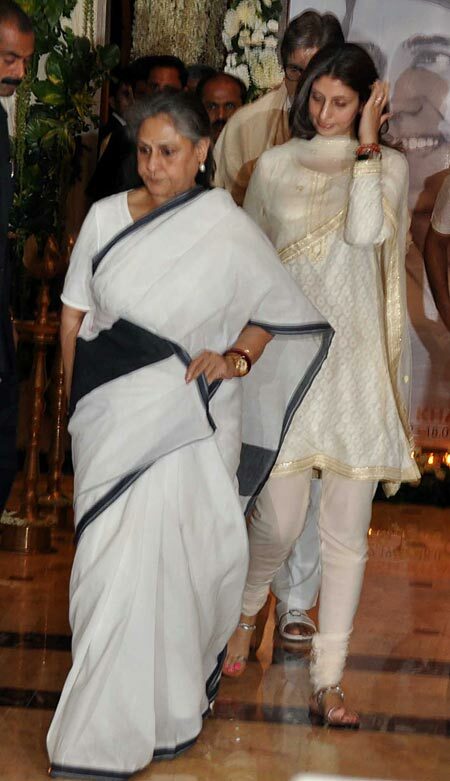 Amitabh Bachchan, who wrote a moving tribute to Rajesh Khanna, arrived with wife Jaya and daughter Shweta. He had worked with the superstar in Anand and Namak Haram. Jaya had also worked with Rajesh Khanna in the hit, Bawarchi. Mithun, who worked with Rajesh Khanna in the big hit Disco Dancer, was spotted catching up with Hrithik and Sussanne Roshan. 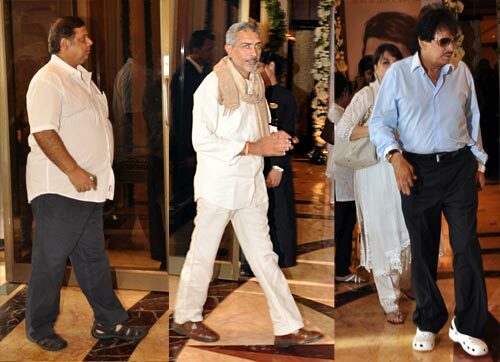 Directors David Dhavan, Prakash Jha and Sanjay Khan also arrived at the chautha. Vinod Khanna arrived with wife Kavita. 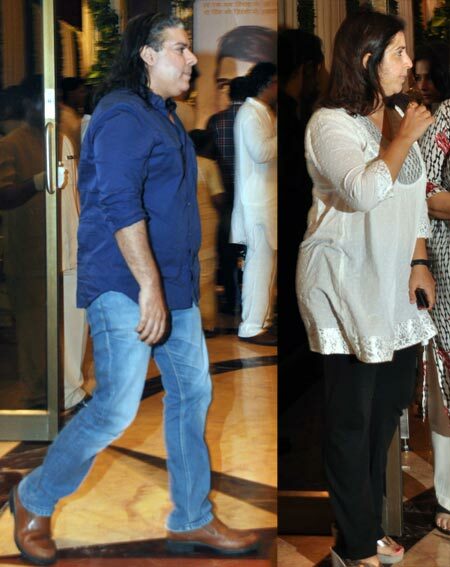 Rishi and wife Neetu Kapoor arrived together. 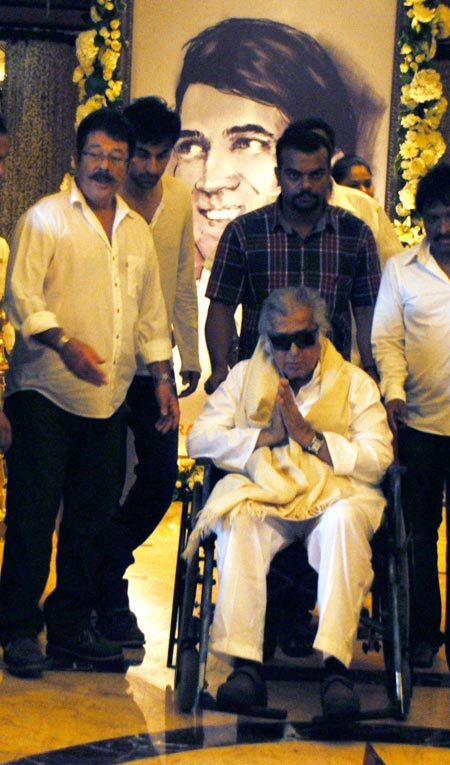 Shashi Kapoor attended the chautha even though he underwent a cataract surgery on Friday. 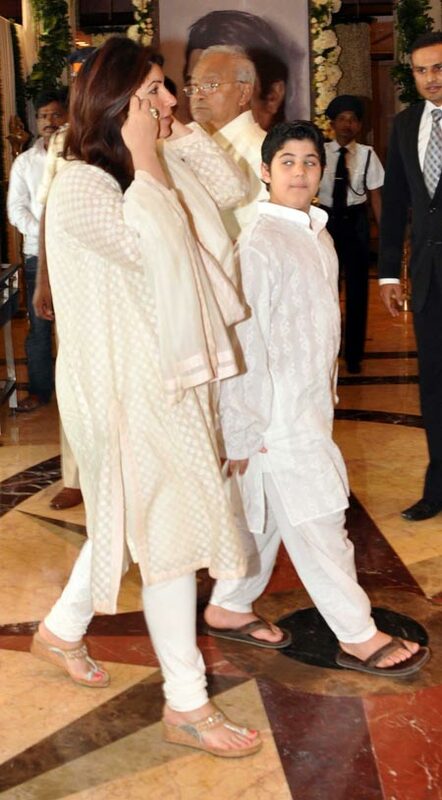 He was accompanied by son Kunal and grand nephew Ranbir. Randhir Kapoor and Rajeev Kapoor (not in the picture) also attended the chautha. Yesteryear actors Prem Chopra and Bindu arrived for the chautha. Siblings Sajid and Farah Khan came to offer support to Akshay Kumar. Sajid is one of Akshay's best friends while Farah's husband Shirish Kunder recently directed the actor in Joker. Akshay's Joker co-star Sonakshi Sinha arrived, as did Deepika Padukone. Tabu and Arjun Rampal's wife Mehr Jesia were also spotted at the chautha. 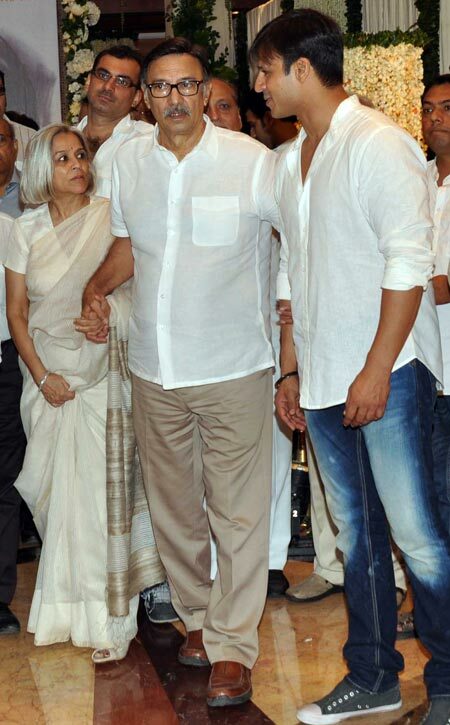 Vivek Oberoi arrived with his parents Suresh and Yashodhara. 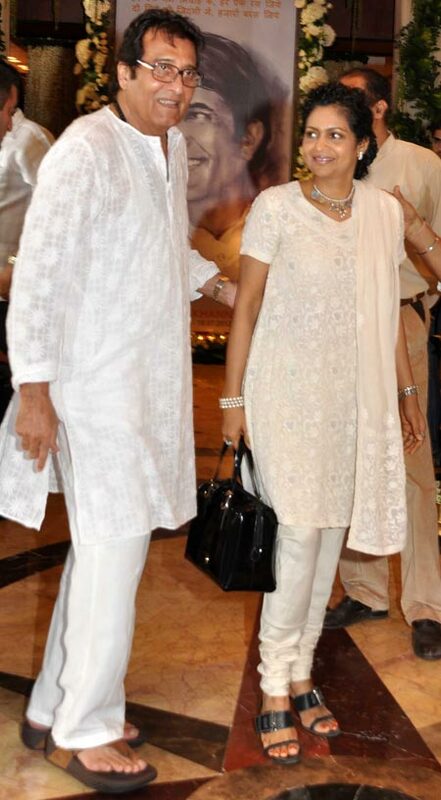 Ramesh Sippy, who directed Rajesh Khanna in the hit Andaz, arrived with wife Kiran Juneja. Rajesh Khanna's school-mate Jeetendra also arrived. Neelam and Neha Dhupia arrived together for the chautha. Amar Singh and Jaya Pradha arrived together. Among the other guests at the chautha were Sunil Shetty and wife Mana, Zoya Akhtar, Prateik, Gulzar, Yash Chopra, Jackie Shroff, and many more.